Artexte’s collection documents the visual arts since 1965 with a particular focus on practices from Canada and Quebec. 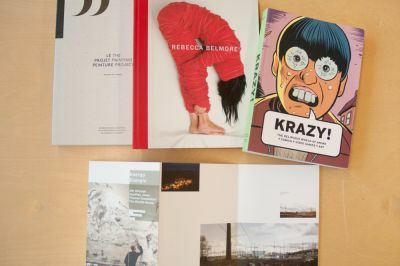 You will find various types of publications, which testify to the artistic practices in Canada and abroad as well as ephemera such as posters, pamphlets, invitation cards, press clippings and visual documentation. These documents reflect a distinct interest for critical approaches to creativity, exhibition, research and interpretation in the visual arts. Artexte’s collection is accessible and open to everyone. We support research in all forms and encourage the discovery and exploration of the collections resources. Our librarians are available to answer your questions at all times. Send us your questions about research in the collection and we will answer you as soon as possible. With our research residency program, we invite researchers, artists and curators to use our documentary resources to explore the collection and further their research on a particular topic. These invitations are made in relation to the interests and research needs of the local and international artistic community. Artexte has previously hosted, Kegan McFadden, Louis Rastelli, Nicole Burisch and Nick Kline among others. Because there are no calls for proposals, we welcome researchers’ suggestions for projects relating to the collection. Send us your questions about research residencies and we will answer you as soon as possible. Artist, curator and art critic files We invite artists, curators and researchers to contribute documents and publications about their work and to keep their files updated over time. We encourage you to open a file in order to help disseminate your practice to researchers and to contribute to knowledge production in contemporary art. These files are an integral part of the permanent collection and are always available to researchers. Write to us for more information on how to contribute documents and publications about your work. We will get back to you as soon as possible. In order to deposit in e-artexte, interested parties must first become members and pay an annual fee based on their operating budget. Individual depositors (professional art critics, curators, historians, artists and theorists) can deposit their publications for free. 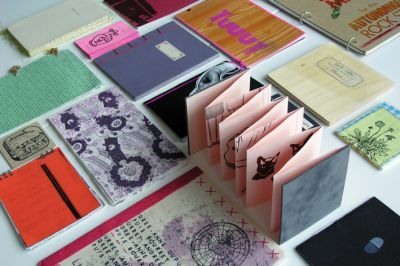 This is a unique collection of over 500 artists’ books and zines from the Projet Mobilivre – The Bookmobile Project (2000 – 2005). A collection of mail art belonging to the Renegade Library project (1996-1998). Lois Klassen an artist based in Hamiota, Manitoba initiated this project. 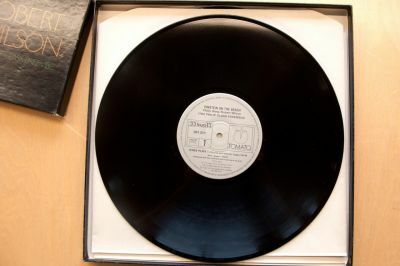 A Relatively Small Collection is comprised of 28 sound art pieces produced by Canadian artists for an exhibition and special project presented at Ace Art Gallery (Winnipeg) in 1999. A series of over 70 unique copyright free zines produced by French artists. A series of 76 posters presented on the L’eau tiède blog, created by Clément de Gaulejac between April 12 and November 2, 2012 in support of the student and social movement of Spring 2012. A project initiated by Luis Jacob from 1996 to 2002, made up of 30 issues which include original artworks by over 90 artists. The project also includes sound recordings, multiple artists and mail art. The Normand Thériault archival fonds contain documents related to Normand Thériault’s life, curator, art critic, historian and art conservator. Please note that this collection is kept apart from Artexte’s permanent collection and is available by appointment only. Please contact collections@artexte.ca for further information. Artexte’s collection also includes digital documents, which are accessible off-site through e-artexte. e-artexte is an online catalogue for Artexte’s collection which contains the bibliographic records for all of the publications of the print collection and allows you to execute searches to find documents related to a precise topic of interest. However, the majority of Artexte’s is available in print format for on site consultation only. Here is an example of a bibliographic record that corresponds to a print publication, available only on-site. e-artexte is also a digital repository which serves as an extension to Artexte’s permanent collection. e-artexte is not a publisher. 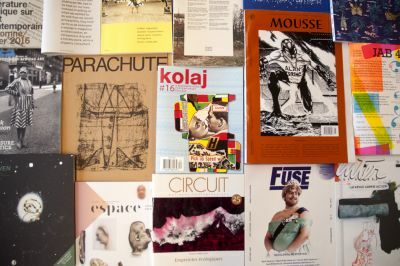 Rather, it gives editors and authors in the visual arts the possibility to self-archive their publications in order to make them accessible online anywhere in the world. Here is an example of a bibliographic record that corresponds to a publication in both formats (print and digital). A digital depository is the equivalent of an online archive, which preserves and makes accessible digital publications. e-artexte ensures a broad access to the works in the online collection, which can be consulted online or downloaded. Open access can be described as free access to the results of publicly funded work. Depositors maintain ownership of the copyrights of the digital publications, which they archive with us and may grant a Creative Commons license for each of the publications they submit. In this way, depositors can specify the ways in which the public may reuse their documents. Consult a variety of resources on open access and digital publishing. Do you have documentation or publications you would like to add to our collection? Let us know if you have documentation or publications you would like to add to our collection. We will get back to you as soon as possible. These thematic bibliographies are created by researchers in residency and the Artexte team. They are a great way to start off your research. Topics include: performance art, ethnocultural art, public art and publishing to name a few. This bibliography on comics preserved in the general collection of Artexte and in the special collection of the projet MOBILIVRE BOOKMOBILE project was prepared by Hugo Santerre at the end of his internship as assistant to the collection in the summer of 2018. This bibliography was created in the context of the exhibition Reading Performance (2017), the third edition of the two-fold exhibition project An Annotated Bibliography in Real Time first presented at Artexte in 2015 curated by Jade Boivin, Emmanuelle Choquette, and Geneviève Marcil with the guidance of Barbara Clausen. This bibliography was compiled in 2017 by Ana Maria Vera – a Masters candidate in Museum Studies at UQAM – as a reference tool on street art and all the urban artistic practices associated with it. This bibliography was compiled by Serge Allaire as part of a research residency at Artexte in 2016-2017. Any new acquisition received after august 2017 may be found in e-artexte, our catalog, by searching for “photobook” in the document type. This bibliography was created in the context of the exhibition An Annotated Bibliography in Real Time: Performance Art in Quebec and Canada presented at Artexte in 2015 curated by Barbara Clausen. This bibliography was compiled by the Ethnocultural Art Histories Research group (EAHR) as part of a research residency at Artexte in 2015. This thematic and chronological bibliography includes more than 400 citations on the subject. This bibliography was compiled by Anne-Marie Proulx for the Call Ampersand Response exhibition held at Artexte from June 7 to September 8, 2012. An extensive bibliography of books and articles on public art and related issues, from Quebec, Canada and abroad. This bibliography was put together in relation to Artexte’s Public Art Project (1997-2007). Articles on art and the public space published in Espace sculpture magazine under Artexte’s supervision from 2002 to 2006. This second version of the bibliography published in 13 Conversations on Art and Cultural Race Politics (Artexte Editions) presents a revised view of this issue in relation to the Quebec context. This bibliography reflects the findings of research done by the coordinators of D&G in preparation for the event presented at FRAC Paca (France) in April 2007. 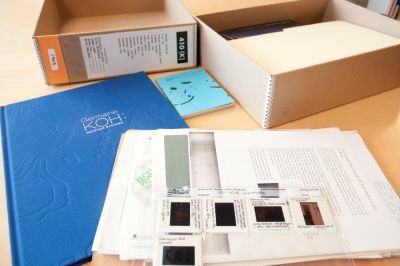 This bibliography was compiled as part of the research undertaken by Michelle Bush during her Research Residency at Artexte (23 March to 3 April, 2009) where she investigated material in the collection related to the state of compassion and the colour green. This bibliography was compiled as part of the research undertaken by a collective of artist-researchers, The Three Graces (Sylvie Tourangeau, Victoria Stanton and Anne Bérubé) as part of the Researcher in Residency Program at Artexte, from October 2008 to April 2009. As the Researcher in Residency, the collective explored the discourses around the performative.